"Everybody hates their phone, and that's not a good thing. And there's an opportunity there." 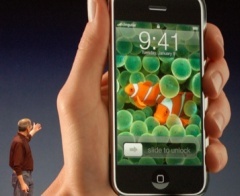 Jobs told Time for a rather interesting and revealing piece chronicling the genesis Apple's newiPhone. (We didn't realize for sure that the iPhone can't use its WiFi to download tracks over the air, for instance.) What started more than two and a half years ago as a foray into tablet computing to counter Microsoft's efforts (whodathunk, Apple really was thinking of building a tablet PC), which inevitably led them to creating the iPhone. If you're the type wondering things like why the new device doesn't have rubber feet, check out the piece, it's a good read.